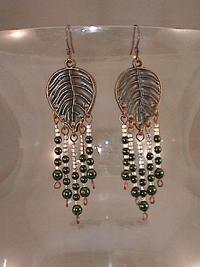 Detailed antique copper leaf findings support long dangles of forest green glass pearls to make a pair of fun, swingy earrings. Perfect for day or evening wear, these affordable dangle earrings measure a full 3" from the tops of their hypo-allergenic niobium French hooks to the bottom of the longest fringe element. Gorgeous, playful and easy on the purse? You can almost feel the hot southern wind blowing through the coiling rays of the copper sun charm in this layered pendant necklace.